This beautiful contemporary 14 oz. 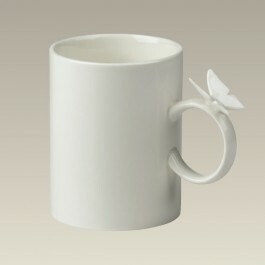 porcelain mug features a whimsical butterfly sitting gracefully on the handle. Measuring 4 1/4" tall and 3 1/4" in diameter, it is very comfortable as the butterfly makes a very nice thumb rest. Made in China, it's dishwasher and microwave safe. This item is a SELECTED SECOND. It contains slight imperfections. All sales final.